To illustrate one specific aspect of the principle of rhythm and one aspect of the principle of balance in the design of a holiday card. Use color paper, magazine pages, collage, paint, stamps etc to illustrate specific aspects of rhythm and balance. Write a brief description and identify the aspect you are illustrating on the back of the card. Students displayed the work illustrating all the vocabulary terms for balance and rhythm from the book. 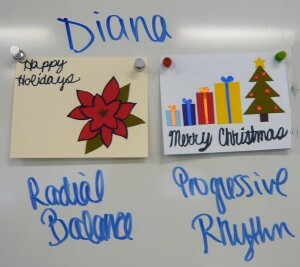 Diana used paint to illustrate the radial balance of the pointsetta and collage to illustrate the progressive rhythm of the presents. 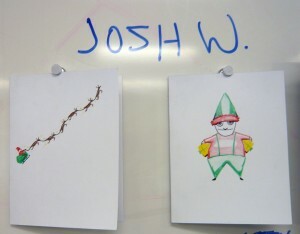 Game design student Josh used color pencil to draw the legato flying rhythm of the reindeer and the symmetrical balance of the elf. 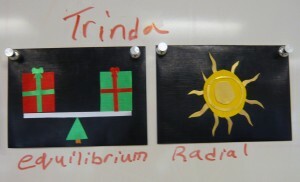 Game design student Trinda used metalic paper collage to illustrate 2 kinds of balance. 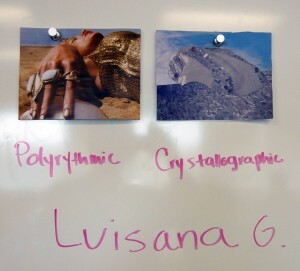 Fachion Merchandising student Luisana used fashiion magazine collage to illustrate polyrhythmic structure and crystallographic balance. Facilitating activities in direct relation to the vocabulary terms provides a situation in which students talk about the material in a practical way as they face a challenge of illustrating vocabulary terms. Making cards offers a casual atmosphere for using the concepts of the lesson in both visual application and verbal discussion.